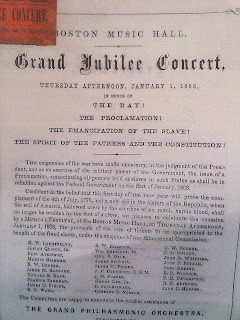 January 1, 2013 marks the sesquicentennial date of the Emancipation Proclamation. 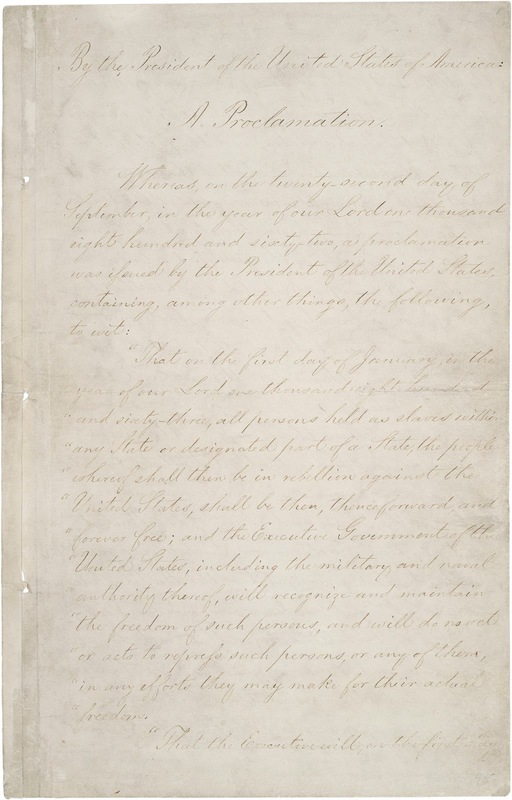 Lincoln had issued the proclamation in preliminary form in September of 1862, after the Union victory at Antietam forced the Army of Northern Virginia out of Maryland, but it did not take effect until January 1, 1863 when he signed it into law. It is four and a half pages in Lincoln's longhand. It is not an elegant bit of writing. Historian Richard Hofstadter famously said the proclamation "had all the moral grandeur of a bill of lading." But Lincoln knew in this case the language was less significant than the act. As John Hope Franklin's helpful short essay tells it, Lincoln said directly before signing it, "I never, in my life, felt more certain that I was doing right than I do in signing this paper." Without speaking for the latter, I would say the former has judged him well. That day, in fact, luminaries in Boston gathered in the afternoon at Boston Music Hall to celebrate. The list of attendees was an extraordinary one. And today our current president, who is indebted as we all are to Lincoln, has issued his own proclamation of observation and remembrance. 150 years since Jubilee Day. Happy 2013 everyone.